If, at the turn of the final decade of the twentieth century, you were to find yourself in or around the Bradford area and in need of somebody to spin some tunes you could have done no better than hiring D.J. Ray Tate and his ‘Disco Sounds’. How do I know this? Because his advertisement in the programme for the match between Wrose Albion F.C. and Fairweather Gr. (whose attendances were always predictably awful due to them having.. wait for it.. fairweather fans *rimshot*) billed him as “Yorkshires Leading Mobile Discotheque” and “the Ultimate in Mobile Entertainment”. 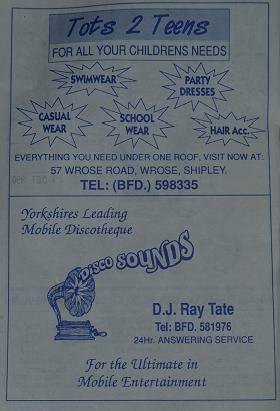 I’m not sure what the mobile discotheque turf war was like in Yorkshire back in those heady days of October 1990 but it was still a pretty ballsy move by Ray to position himself as disco king. Perhaps one of the reasons for his confidence was the “24 hour answering service” he had in operation. That’s quite the commitment to bad music! One can imagine a Batman style light in the shape of a glitter ball beaming brightly into a mournfully coloured sky above the Salts Mill at five in the morning as Ray pulls on his flares and grabs his Norma Jean twelve inches before jumping into his Funkmobile to race over and provide Ultimate Entertainment at a moments notice. 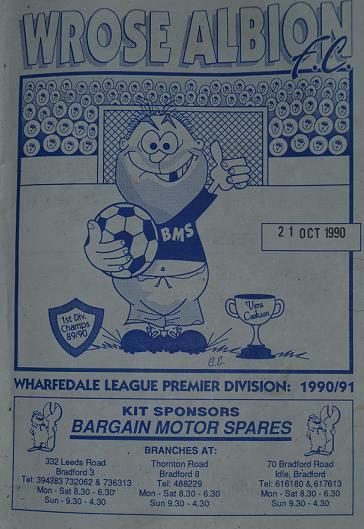 The cover of the programme for this District Cup clash features a cartoon of an unshaven, overweight hooligan looking type holding a ball and giving a thumbs up in front of an optimistically full and happy stand. Is this an honest impression of the type of player plying their trade at Wrose at the time? Beside him on the pitch sit a shield commemorating their previous season as 1st division champions and, more excitedly, the prestigious “Vera Cookson cup” (even after extensive research I am none the wiser as to who Vera Cookson was but did at least uncover this amazing photograph of former winners Grafton Garage that appears to show a young Phil Jupitus and a player who apparently preferred to sport of-it’s-time knitwear rather than the actual kit). As is often the case with match literature this far down the football ladder (and by the time you reach clubs in the Wharfdale League Premier Division you have departed the ladder altogether and are now digging feverishly at the soil with your fingernails) the product is rather flimsy at a meagre 14 pages and eighty percent of that is taken up with advertisements. 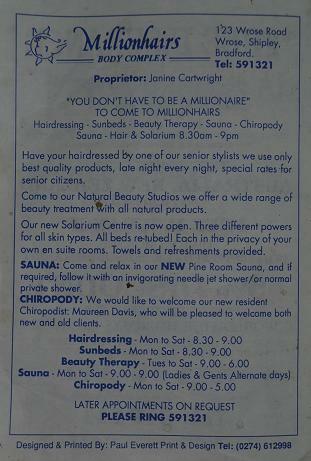 Luckily local advertising is one of our favourite things here at Classic Programmes and there are a couple of gems to satiate our appetite. Aside from Mr. Tate and his non stop disco madness there is a Fisheries that is rarely open, a print & design studio that boastfully promises to deliver “on time!” as if the minimum requirement for a business is a major selling point, and the unappealingly titled ‘Millionhairs Body Complex’ where “you don’t have to be a millionaire to come to millionhairs”. With all due respect to Shipley it’s hardly the Millionaires’ Mile so I doubt that really needed pointing out and also.. Millionhairs? Really? Is this a beauty studio designed specifically with Chewbacca in mind? As for non commercial content we get the staple half-hearted sports and music quizes and the usual array of statistics nobody really cares about and yet with a closer inspection shows that from the first twenty seven games the ten teams in the league had managed an impressive 124 goals between them. That’s an average of about four and a half goals each match. Bizarre then to find K. Attenborough sitting atop the goal scorers table with a mere five strikes to his name. Only two other players had scored more than one goal! By my calculations it appears that one hundred and thirteen other players shared a solitary goal between them. Either that or the person tasked with recording statistics had a very tenuous grasp on the truth. The highlight of the programme, however, is the ‘Pick of the Past’ section which features a match report from the esteemed Shipley Times & Express from 1978. The game in question is a cup tie between Wrose Albion and Junction and features a description of a 50 yard punt being headed home as “picture-book” (presumably the artist of that particular book was Sam Allardyce) and makes mention of a “cheeky ball” being chipped in for Albion’s fifth which raises the surreal philosophical question as to how a ball can possibly be cheeky? Of more interest than all that, however, is the revelation that this game was the first match of the season for young Ray Tate. Yes, that’s right, the Tadcaster Travolta himself was involved in a game where he managed to concede a penalty and later be substituted after cutting his eye. Not the greatest of debuts then. Just as well the world of Disco awaited him. The plot revolves around the two aforementioned fans of the Silkmen who, with nothing better to do with their lives, choose to while away the hours online (especially impressive given that at the time it was written the internet as widely now known was roughly fifty years from coming to fruition) pontificating on the scouse striker’s possible merits, whether given his millions made in property he was considering buying the club outright, and jokily mulling over which of Fowler’s former Liverpool team mates would be suited to roles within the backroom staff (in an example of Beckett’s famous gallows humour the job of ‘tactical intelligence’ was given to Jason “I’m not that hungry” McAteer). A lot has been made of the absurdist nature of the play – much of which stems from the idea of a football club with nobody at the helm continuing its business of retaining players and selling others on to rivals whilst potentially placing its hopes of promotion and long term survival in the lap of a man whose only previous experience of management was at Muangthong United in Thailand. Indeed throughout there is the suggestion that perhaps Fowler is more reputation than actual substance – his rejection of a penalty he had falsely won, his ‘Spice Boy’ image complete with cream F.A. cup final suit, drug taking goal celebration, and online beefing with ex-pros all stand out clearer in the mind than anything he has actually achieved in the game beyond a fast hattrick against a pre-Arsene Arsenal. This idea is neatly summed up during the first act when one of the two supporters asks what exactly ‘God’ will do for them when he is appointed. “Oh… nothing very definite.” is the rather desperate reply. Then there are the existential elements to consider. How does a supporter of a club like Macclesfield continue to function whilst in possession of the knowledge they will likely never achieve anything of real note? A common recent criticism of the monied clubs is they lack ‘history’ which seems to mean that within the Premier League era they had previously failed to win a major trophy. Where does this leave a club like Macclesfield with not even a hint of a major trophy in their past and no realistic chance of attaining one anytime soon? Do they have no history? No future? Are they merely a ghost fart of a club lingering only ever in the now? Perhaps the managerial merry-go-round is one of the places they find help in dealing with this crisis of existence. The discussions and arguments created by a managerial vacuum are a way of convincing themselves that there is a point – that the next person to take possession of the job could just be the one who completely turns it around regardless of what obstacles he would face in the process. The ‘what-if’ is a far preferable scenario to be faced with than the ‘what-now’ that follows when whoever takes the hot seat inevitably fails to live up to the task. 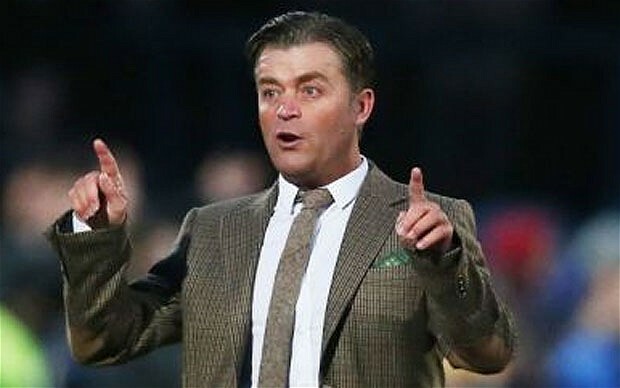 The two characters spend the majority of the play pondering over the possible scenarios that might play out when God arrives because the reality – that the club, having already failed in an expensive gamble on a dodgy manager unproven at that level, are now planning to gamble on a well known former player unproven at that level – is too much to bare. At the end of the play someone purporting to be Macclesfield Town chief executive/laughing stock Jon Harris arrives to post an announcement that no decision is due upon the naming of a new manager due to indecision over the transfer budget or some such nonsense but that there would definitely be exciting news the next day. In response the two disappointed fans angrily announce their decision to stop supporting the club in favour of a more worthwhile pursuit. Everyone in the audience watching, however, knows that the two fans will remain. Refreshing over and over the news page of the clubs official website. Still yet waiting for news. Still yet waiting for God. Around twenty years ago when I first started attending games at my home club I chose the London Road terrace as my place to stand and observe the match that was taking place before me. The terrace was usually scarcely occupied and those who were in attendance around me were mostly wizened old men or women who would occasionally grumble their discontent at the linesmen or opposition players passing within earshot but rarely with any real form of venom – more the sort of disgruntlement a person may have for a late bus or a canceled episode of Eastenders. Harmless really. I found a particular spot on that terrace and, regardless of results or performances, decided it was ‘lucky’. I would arrive at the game an hour before kick-off, purchase my programme, and home in on that area that, in my head, belonged to me. The area that – as long as I was within the general vicinity – would help spur our courageous Silkmen through to victory. The “Macclesfield division” of the EDL used to have a blog that was as garishly unappetising as it was contradictory and incomprehensible. I say “used to” because the last new content on there was posted on the first of December 2010 – presumably because the struggle those behind it were having with the English language wasn’t worth the effort (sample quotes – “we couldn’t care weather they are black,white,asian”, “no wonder their are thousands of angry men and women”, “a decision we was later to regret but was not to know at the time.”) The irony that a group of people who love being English so much can’t be bothered to learn the Basic Rules of the language is particularly delicious. Elsewhere they complained that the police “are not happy that the EDL have a following from Macc and for some reason think Macc has a hooligan problem” shortly after casually mentioning that “one of the lads had been in court after fighting broke out between Macc and Stockport lads”. Meanwhile their unyielding support for the side (“Macc & Proud”) was portrayed with unflinching honesty (“We lost the game 6-0 but left at half time as it was a joke of a match and quite simply Macc were f****** awful.”) You could almost find it funny in a sort of darkly humorous way if they weren’t 100% serious about it. These people are racists. They claim not to be. They put disclaimers everywhere. They may have bought a Roni Size album once or walked past a black guy without spitting in his face and whoop-de-doo. They mask their hatred for anything non-white behind a thin veneer of attempted respectability that disappears the second you take a closer look. 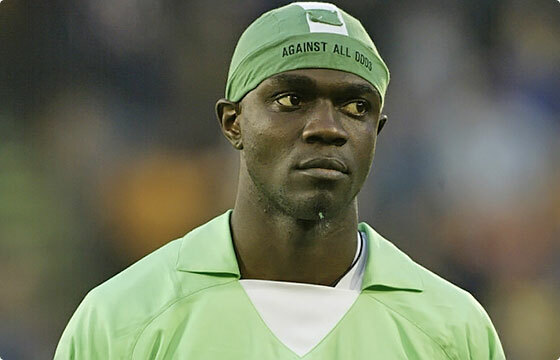 I have personally heard them hilariously refer to then Bolton player David Ngog as “David Nig-Nog” and chant “We are Senegal” when a black player was brought on as a substitute for Macc during a pre-season friendly. This is not just gentle football ribbing. This is phlegm-specked bile thinly disguised as ‘banter’. It is clear that the threat of a lifetime ban from the club is the only thing stopping them from out and out monkey noises and throwing bananas onto the pitch. 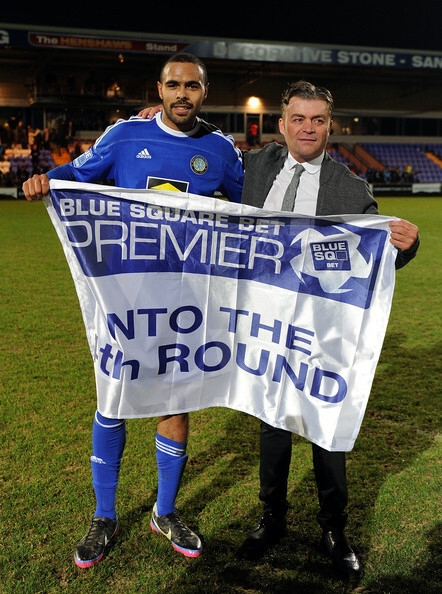 In truth it must be a constant source of internal conflict for them; that in recent years the number of non-white players representing Macclesfield Town has gradually increased (and to the benefit of the team) against their wishes. This is made perfectly clear by their ‘chant’ for club captain Nat Brown – “Big head, big nob” – which, in a desperate attempt to scramble for praise for the oft excellent defender, resorts to a crude stereotype about black people. The recent Cardiff F.A. cup tie was the tipping point for me. These people are not in support of the club. The majority of their chants were either vile/provocative abuse aimed towards the opposition fans and players, or pathetic attempts to promote their extreme right-wing agenda. 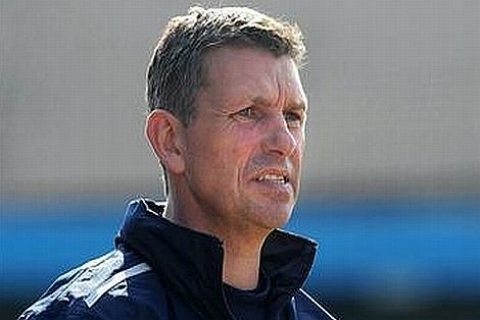 Steve King, the Macclesfield boss, was dismissed as a “cockney w****r” prior to the win and praise or encouragement for the home players was rarely heard before the result was secured (at which point they celebrated as if they were vital components to the victory). The English flag, as often is the case with the extreme right, was used as a provocative gesture rather than a source of pride. They taunted the Cardiff ‘Soul Crew’. The intentions were clear from the start. A fight broke out behind me at one point during the second half – the rhyme or reason of which I do not know. The police and stewards stood by and watched. Some stewards shared jokes with them. Smiled at their extreme language and braggadocio. What hope do we have? Seriously? Even those ‘on our side’ are on their side. I’m not going to stop watching Macclesfield Town play. When my son is old enough to attend with me I will drift over into the family stand on the opposite side of the ground. Until then I will remain on the London Road terrace, will continue to support the club I love. Support them in the right way. The only way. No surrender to the EDL.